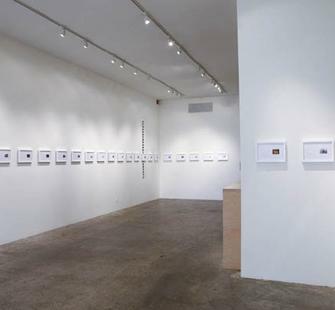 As part of AGENCY: The Work of Artists, Montalvo presents in its Project Space, In Possession of a Picture, or, what is and what is to take place hereafter (2008), by frequent collaborators, Julia Meltzer and David Thorne. Their installation consists of a series of 50 photographic diptychs about incidents in which people have been stopped, questioned, detained or arrested for photographing particular sensitive sites in the United States (such as bridges, casinos, banks, landmarks, tourist attractions, etc. ), or in which people were detained for other reasons and subsequently found to be in possession of videotapes or photographs of these same sites. The images in question are not publicly available nor do the artists have access to them; they only have knowledge of where the incidents took place. Each diptych refers to a particular occurrence. The site itself – Disneyland, downtown Atlanta, the J.P. Morgan Chase building in Dallas, etc. – is represented by an image selected from the millions of available pictures circulating on the Internet. The unavailable image – the picture that someone was found to be in possession of – is represented by a vacant rectangle with a simple black border that defines a space into which audiences can project anything. In addition to their installation, Metlzer and Thorne's award-winning film, We Will Live to See These Things (2009) shot over a tumultuous two year residence in Damascus, is screened in the Carriage House followed by a Public Conversation with the artists and a response by Saba Mahmood, author of Politics of Piety: The Islamic Revival and the Feminist Subject (2005), and Associate Professor of Social Cultural Anthropology at UC Berkeley.